The ‘Filettino experiment’ could be an interesting one – with most in the town, population 598, favouring independence. 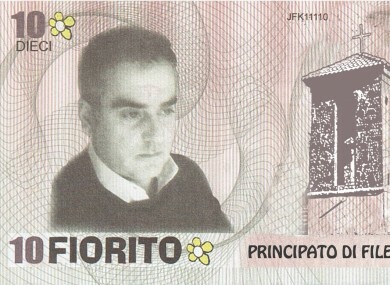 A banknote worth 10 fioritos - or exactly €20 - as is now used in the Principality of Filettino. The face on the note is that of mayor Luca Sellari. AN ITALIAN TOWN has begun to print its own currency – and wants to declare independence – in protest at government plans to merge small towns in an ambitious cost-cutting drive. Filettino, which lies around 60 miles to the east of Rome, has a population of 598 – a population small enough to see the town officially merged with a neighbour under the emergency cost-cutting Budget currently before the Italian parliament. The move is set to affect just under 2,000 towns – and while some of them have taken to appealing for Libyan refugees, hoping to cross the 1,000-population threshold that safeguards their status, Filettino’s plans are a little more ambitious. Instead of merging with nearby Trevi, as Reuters reports, mayor Luca Sellari – who has only been in charge for three months – instead wants to secede from the Italian Republic, declare independence, and live as an independent entity. Italy as a country has only existed in its current shape for less than two centuries – forged across the 19th century through the gradual amalgamation of city-states – with many rural areas still fiercely proud of their local traditions. In Filettino’s case, the merger programme has been particularly badly received, especially since the town had previously boasted a population close to 3,000 – well above the threshold that would have been needed to maintain its individual status. The New York Times reports that Sellari has already started forging a distinct local economy – with the local currency, the Fiorito, pegged to the euro (one fiorito is worth €2 – meaning the town could already boast an exports advantage) and already being used to buy t-shirts and liquor bearing the town’s coat of arms. Opponents of the government’s merger programme say that local mayors and councils only cost the Italian state less than €6m a year – around the same amount that the taxpayer spends on the restaurant in the Chamber of Deputies, the 630-member lower house of parliament. Last week the government backtracked on the programme, saying towns could keep their individual statuses, but that they will still have to perform as-yet-undefined “fundamental functions” on a collective basis by 2013. Email “Italian town prints its own currency - and wants to declare independence”. Feedback on “Italian town prints its own currency - and wants to declare independence”.